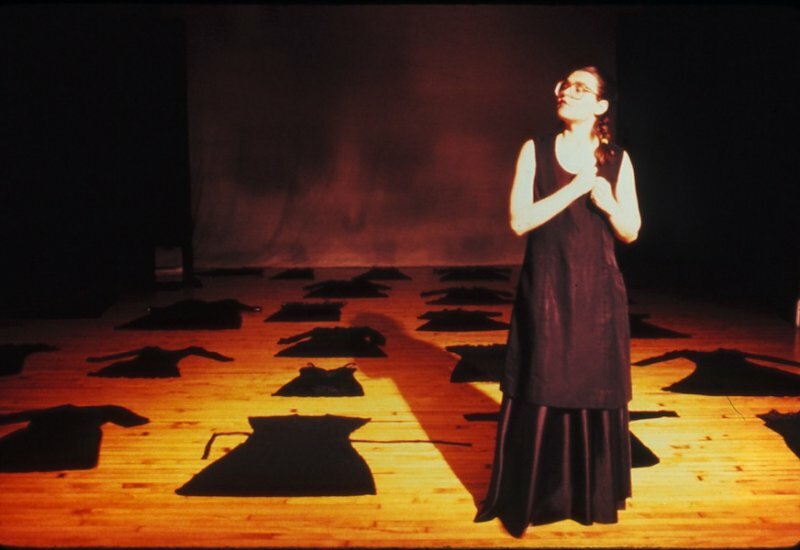 In the performance, thirty black dresses cover the floor, are folded, worn, piled and moved as a heritage of graveyards, bad blood, secrets and family loyalties is explored. Generations of women walk the razor’s edge of madness under a veil of southern manners and genteel eccentricity. Weaving the personal and the social, “To us at Twilight…” evokes emotionally charged archetypes as it addresses issues of racism , sexism and the hopeful persistence of the human spirit. For further detailed description see reviews. 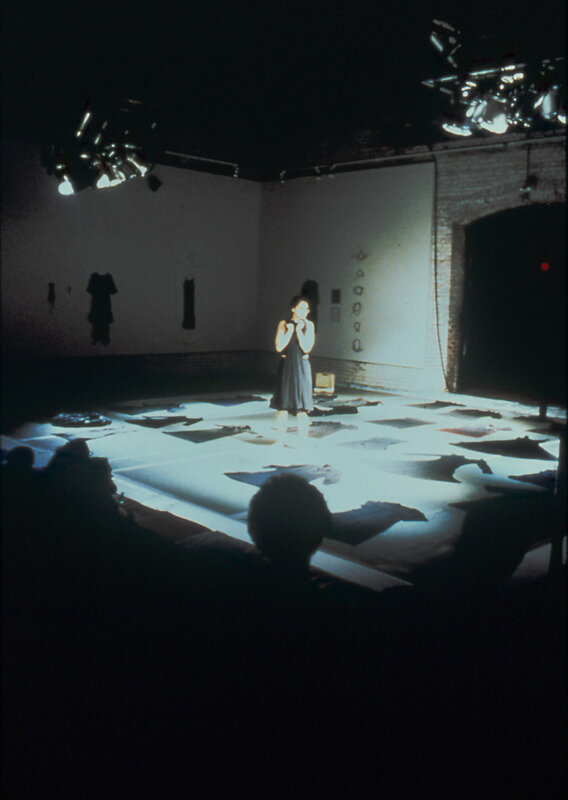 To Us At Twilight… was commissioned by and presented at Performance Space 122 in 1990. 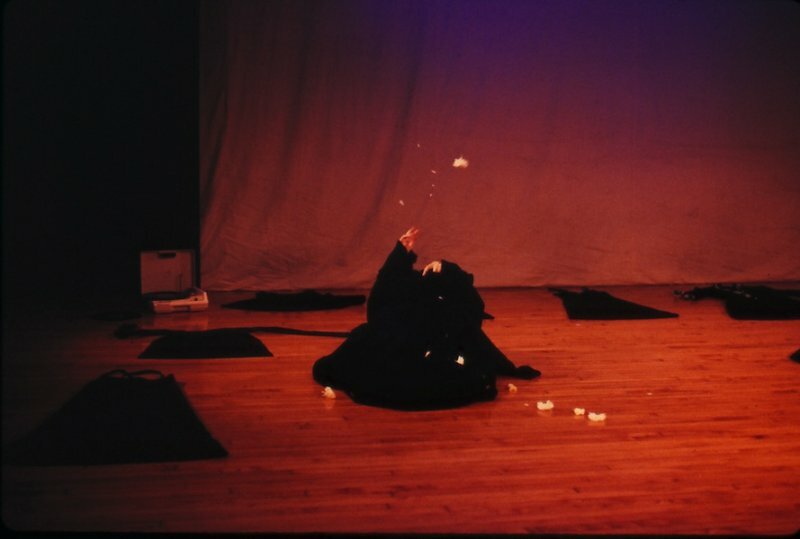 The performance was expanded to include an installation and presented at Artist Space, NYC in 1993. 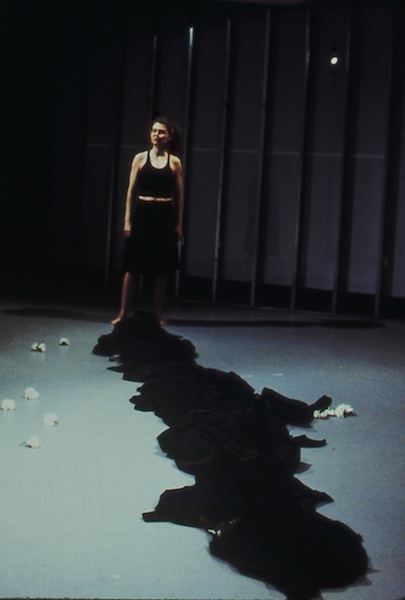 In 1994 King Plow Art Center commissioned further development of the installation and performance for The Atlanta Arts Festival. 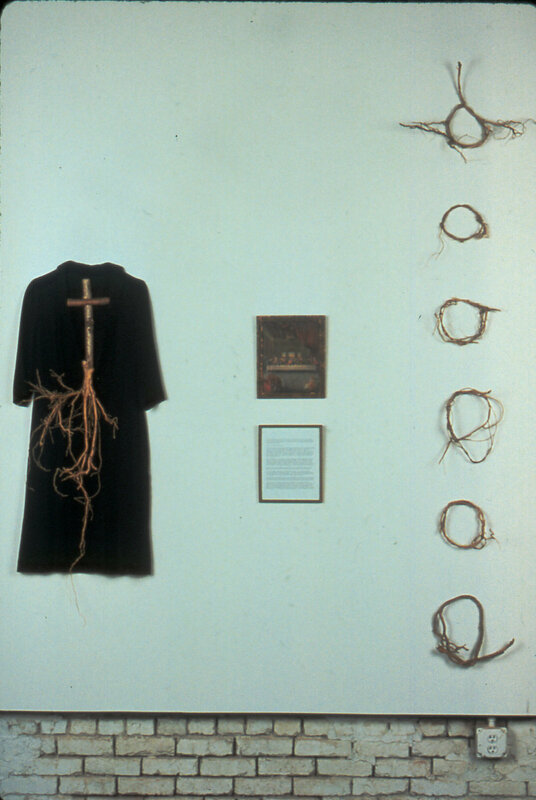 PLACES PERFORMED/EXHIBITED: ARTIST’S SPACE, NYC; PERFORMANCE SPACE 122, NYC; NEW LANGTON ARTS, SAN FRANCISCO; CONTEMPORARY ART FORUM, SANTA BARBARA; KING PLOW ART CENTER, ATLANTA ARTS FESTIVAL, ATLANTA; SARRATT GALLERY & THEATRE, VANDERBILT UNIVERSITY, NASHVILLE. PRODUCTION BUDGET, TECHNICAL REQUIREMENT AND SCRIPT AVAILABLE UPON REQUEST. 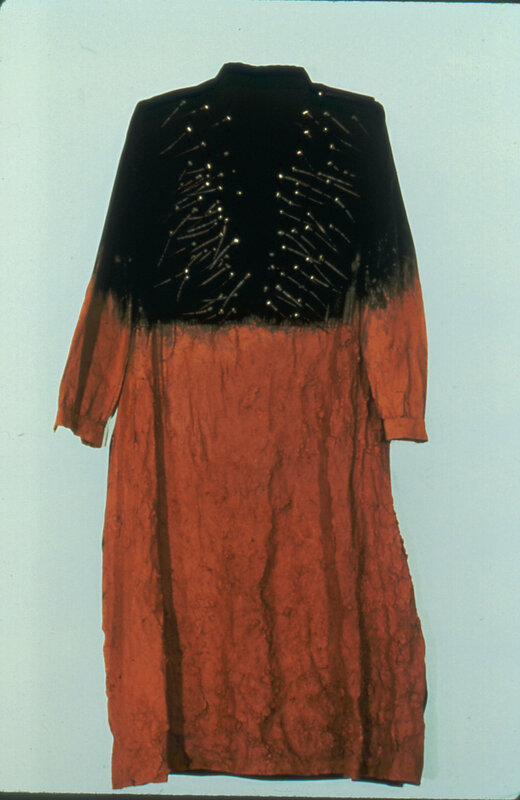 The viewer entered the lower level gallery facing a 20ft illuminated dress hovering over a chair filled with fresh honeycomb. 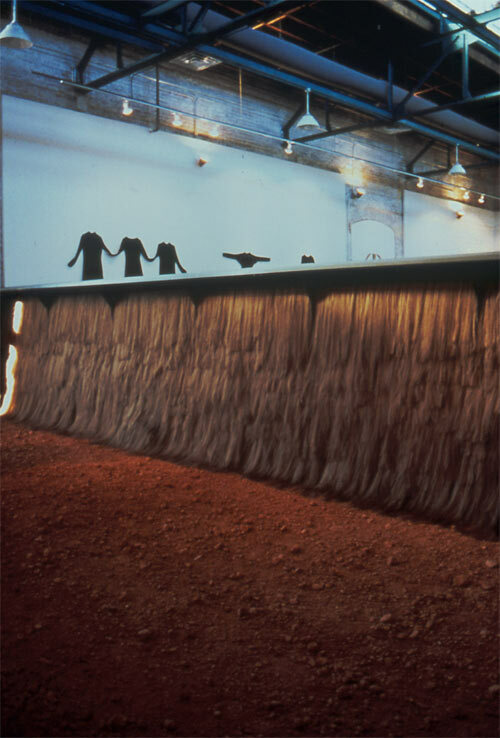 Behind this was a 33 ft. long, 8ft high wall of auburn hair cascading onto a 35ft square floor covered in red-clay dirt. 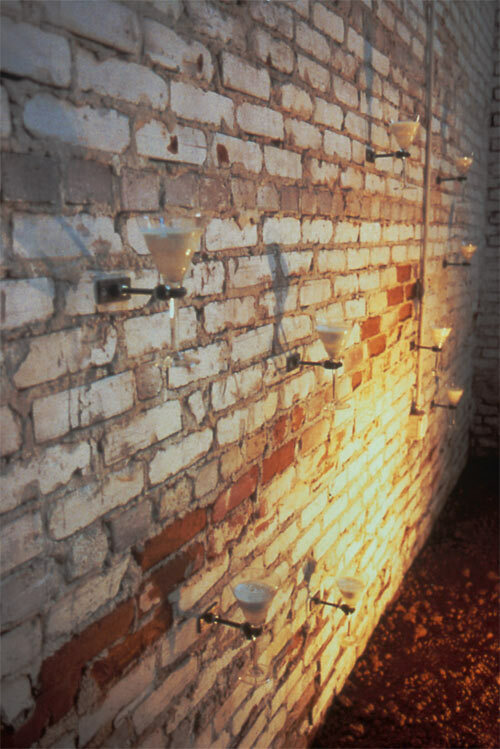 Viewers then discovered a wall covered with mounted crystal glasses filled with milk facing the 20ft dress. 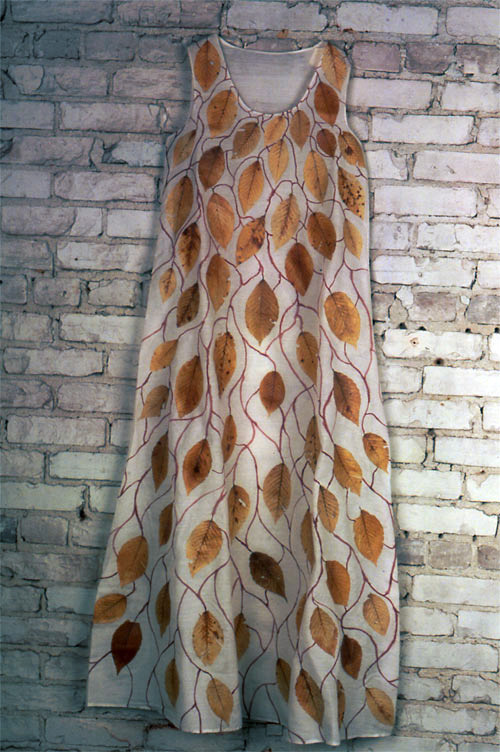 (Above left) “SweetBriar Woods in March” 1994 sheer curtain fabric, leaves, paint, blood, thorns, snake skin, graphite. 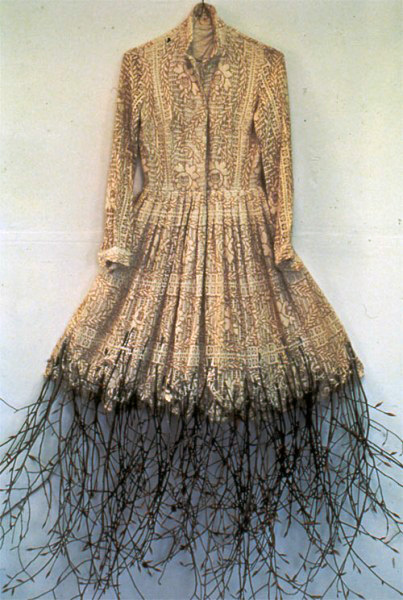 (Above right) “Beechwood Needs Pruning in Spring” 1994 cotton lace dress, beechwood buds. 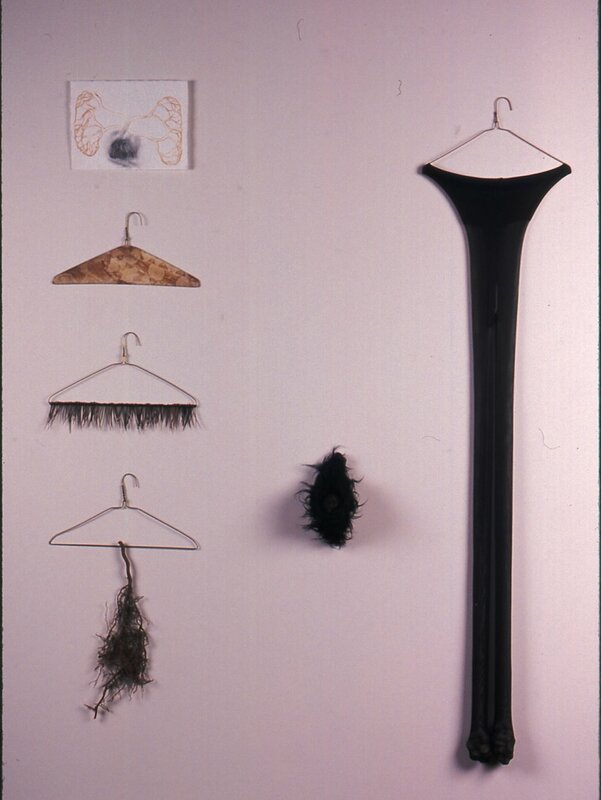 The following seven images show details of the dresses and other objects in the installation, each bore text from and were related to the performance. 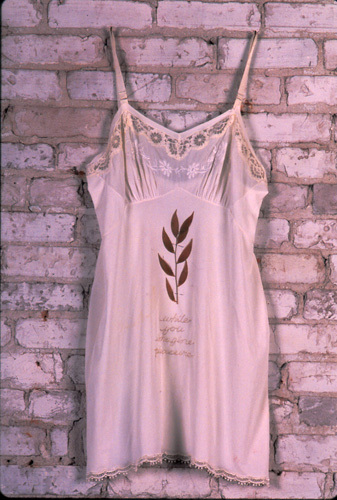 (Below) “Cousin Becky” 1994 vintage dress, straight pins, rose petals, text. The text below was written on an old typewriter and pinned, line by line, to the dress. “My first cousin Becki, we were the same age. 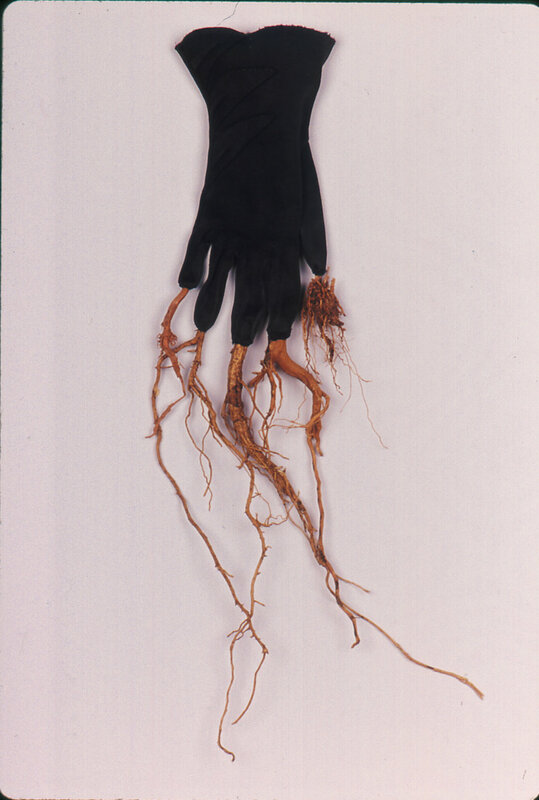 She would sit for hours picking at the skin of her wrist and forearm with a straight pin. She would carefully slide the point underneath the first layer of skin and then twist it down until the blood slowly surfaced or sometimes she would make quick repetitive jabs. She was always absorbed in the minutest details of this procedure, and though the results were obvious, we never spoke of them, nor did anyone else. My observations were covert. We were both nine. 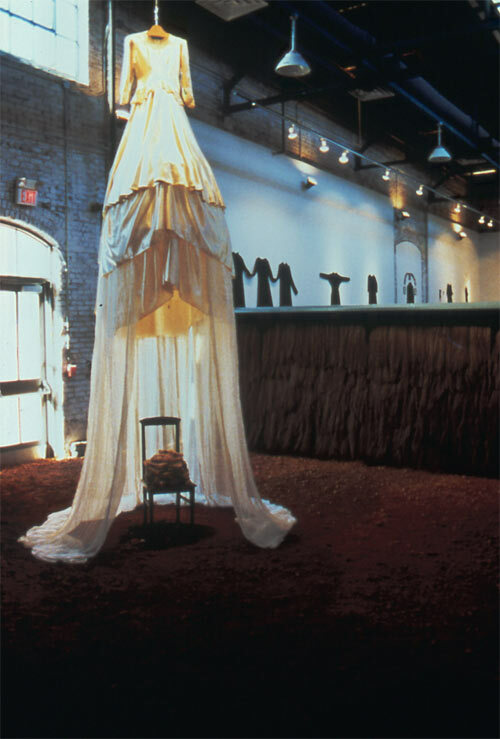 “Alyson Pou transformed the cavernous two-level gallery space at the King Plow Center into a place of dreams, stories, objects, movement, and tableaux, thoughtfully considering the architecture of the space to present her exquisite installation and performance, “To Us at Twilight."